I’m a queer transguy, West Australian born and bred… I live with my partner, my dog and an ever-changing array of houseguests. I spend just under half the year in Sydney, which I really enjoy too. I go there for work – I’m the Director of Research & Public Affairs for the Inspire Foundation (a national youth mental health organization that delivers the online service ReachOut.com), my team is all based in the Sydney head office. What bike do you own, and how long have you had it? 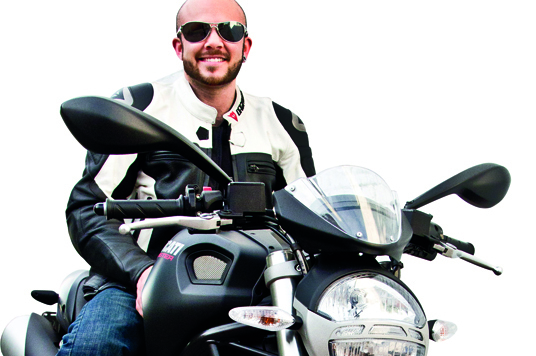 I ride a Ducati Monster 696 – I’ve had it for about a year now. I started riding for purely financial reasons. I was a poor university student, had just written off my car and worked out that I could get a much better quality motorbike than I could car, AND it would be far cheaper to run. Then once I was riding, I fell in love with it, and that was that. Is this the first and only bike you’ve owned? This is my second bike, my first was a Honda NSR 125 in replica race colours. My partner’s now wearing that one. When I sold the bike I used the cash to buy her a ring! What do you love the most about your bike? It looks like a beast! It’s a really simple, no fuss, but aggressive looking urban machine. I love the way it sounds, too, especially on deceleration when it pops. What do you like best about motorcycling? It might sound naff but you’re kind of ‘at one’ with the machine. In a car you can be distracted by the radio or passengers, and you’re disconnected from what the car is doing – you just push buttons and pull leavers and the car does things. On a bike, you’re literally physically maneuvering it, there’s nothing to distract you, and the environment you’re moving through is right there, there’s nothing between you and it. I really like that. I also like the fact that you never get stuck in traffic, it’s easier to find parking, and cheaper to run. And of course, motorbikes are incredibly powerful. Even if you don’t ride especially fast, the acceleration when you first take off is pretty awesome. I love acceleration. What’s your least favorite thing about it? Bad, distracted car drivers are easily at the top of the list – they have the potential to be lethal, literally. If a genie could grant you any bike in the world, which would it be? I’d want to be greedy and have two. The first would be a Ducati Monster 796 – with all the fancy modifications, of course. It’s the big(ger) brother of my motorbike – bigger, badder, faster. I can’t actually have it because it’s too tall for my short-arsed self, but if a genie was doing the supplying, I’m sure we could work something out. The second bike would be, again, a nicely modified Triumph Thruxton. This is a really retro looking bike (typically called a ‘café racer’) which has a different riding style to the Ducati. Are there any great bike moments in cinema that you love?